The camera's value is about $ 125 in the condition you describe. Pony Premo B's were made from about 1893-1899. The glass plates usually are worth about 50 cents each - much more ( a few dollars each ) if there are interesting ( ie...collectible ) subjects like trains, towns, buildings, mountains, spoting events etc. History: ......."In 1883, the "Rochester Optical Company" was established by W. F. Carlton. Meanwhile, in January 1884 William Walker joined Eastman to make the Eastman-Walker Roll Holder, and the following year he became secretary to the Eastman Dry Plate and Film Company. Shortly after this Walker was sent to England as Eastman's representative in that country. The new Rochester Optical Company was located at 9 and then 11 Aqueduct Street, near the four corners in Rochester, and at first they continued to make some of Walker's cameras. They soon added new models of their own, their most successful innovation being the "Premo" line, introduced in 1893 and continued for almost 30 years. In 1890 the plant was moved to 5 South Water Street, and early in 1895 to its final home at 45 South Street, the building being still in existence. 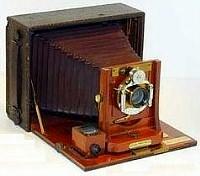 In 1891, H. B. Carlton, brother of W. F., decided to set up a rival company in the old building at 13 Aqueduct Street, which he called the "Rochester Camera Manufacturing Company," making Poco cameras. This became the Rochester Camera Company in 1895, at that time located at 29 Elizabeth Street, and finally in 1897 the Rochester Camera and Supply Company. In 1899 five camera companies decided to join forces to form the "Rochester Optical and Camera Company." They were: the Rochester Optical Company, the Rochester Camera and Supply Company, the Ray Camera Company, the Monroe Camera Company, and the Western Camera Manufacturing Company of Chicago. The new combined company occupied the R.O.C. building at 45 South Street. In spite of this union, their products retained their old names of Poco, Premo, Ray, and Cyclone, The officers of the new company were W. F. Carlton, manager, with H. B. Carlton, B. E. Chase, and F. P. Allen. Unfortunately the new combined company was not a success and lost as much as $100,000 a year, so in 1903 their entire assets were acquired by George Eastman for $330,000, and their name was changed back to the Rochester Optical Company. In 1907 it became the Rochester Optical Division of the Eastman Kodak Company, and in 1918 the Rochester Optical Department. The factory at 45 South Street became Kodak's Premo Works from 1912 to 1921, after which the name was finally abandoned and the building sold."